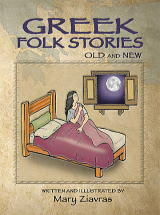 Author Mary Ziavras creates a delightful and heart-warming collection of folk stories for young and old, continuing a rich Greek tradition of oral storytelling. 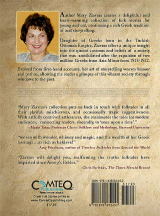 Daughter of Greeks born in the Turkish Ottoman Empire, Ziavras offers a unique insight into the quaint customs and beliefs of a society that was annihilated after the expulsion of two million Greeks from Asia Minor from 1915-1922. Evolved from first hand-accounts, her art of storytelling weaves humor and pathos, allowing the reader a glimpse of this vibrant society through windows to the past. "Mary Ziavras's collection puts us back in touch with folktales in all their playful, mischievous, and occasionally tragic suggestiveness. With artfully contrived artlessness, she reanimates the tales for modern audiences, connecting readers, viscerally, to 'once upon a time'."